The past year has been a wake-up call on of just how quickly our lives can be turned upside down by extreme weather events. 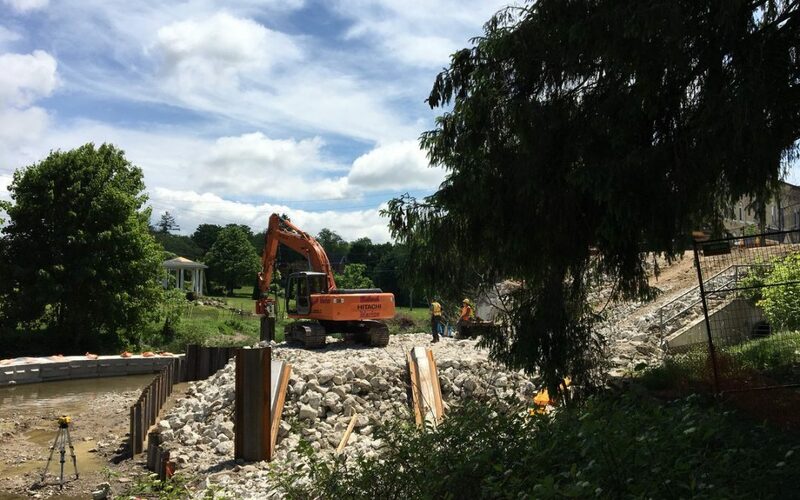 In February, the town of Chesley, Ontario where I grew up was split in two by a flash flood that took out the bridge that served as the only route across town. The bridge had been scheduled for replacement in 2021, but the flood moved the replacement to an immediate need. We’re currently sitting at 14 hurricanes for 2018 and counting, with the wreckage lying behind in the hands of our communities to rapidly respond and restore essential services and infrastructure. So how do our project leaders manage to successfully deliver “Flash Track” projects – meaning even faster than fast-tracking – in these situations? 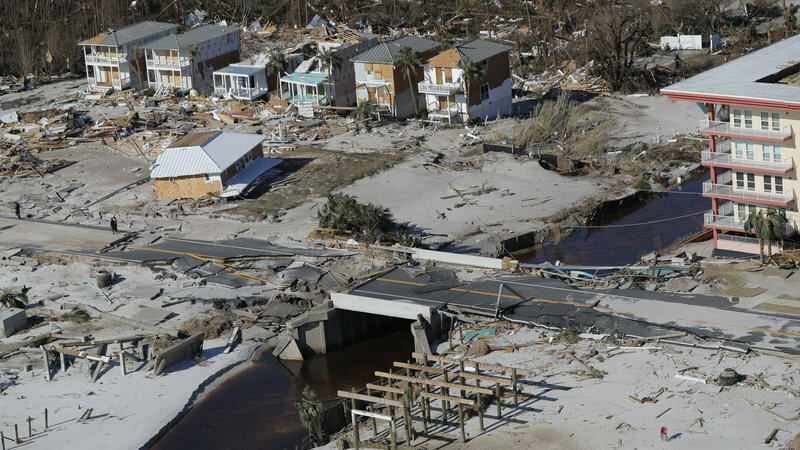 CII has been working to help project leaders respond rapidly, providing effective and critical leadership as communities work to “bounce back” from the devastation left behind from extreme weather events. In a recent webinar, I had the pleasure of hosting one of CII’s most esteemed academics and a researcher for CII’s Flash Track Readiness Tool, Dr. de la Garza from Virginia Tech. He helped us understand what is unique about the Flash Track project delivery strategy, and the CII tools available to help project leaders kick-off successful Flash Track projects when faced with an emergency rebuild situation, time to market constraints, or immediate regulatory compliance issues. The key element that sets apart a Flash Track project from typical projects is time. Flash Track main characteristic that sets it a part from other projects is its time driven and laser focused mentality and approach. With this time-focused approach comes the need for a heightened degree of concurrency in the engineering, procurement and construction phases. Components of each of these phases are shortened or adjusted so that “everything happens at once”. The Flash Track approach is not simply an acceleration of activities, but rather an addition and adjustment of components of Front End Planning, in particular, that help propel your project forward. A Flash Track project must preserve team communication and ensure the project organization is fully aligned while creating “schedule savings”. The typical “EPC” model is redefined through the cPEpC model- Commitment, Procurement, Engineering and then repeated Procurement flowed by Construction. Following this model helps the team deliver on a Flash Track schedule. The cPEpC model is used as a framework for executing a successful Flash Track project. The “little c” at the start of the model reflects the need for upstream commitment and involvement from construction phase stakeholders. Construction must be a part of the front end planning and decision-making process to establish the optimal path of construction. Alongside this, we must then engage suppliers and procure all strategic equipment and materials prior to the start of engineering. This is reflected by the “big P” that precedes engineering. The upfront involvement of construction and early procurement activities are hard commitments to make, but they are essential to support concurrent activities. The path of construction drives the project from the very beginning. The balance of procurement is completed in parallel with engineering. What Does it Take to Flash Track a Project? The “A-Team” – Accessibility to or creation of an “A team” with Flash Track experience will set the standard for a fully integrated team and encourage participants to have an open mind. Not only is it a necessity for the team to be fully aligned, but the stakeholders involved should also be a part of the front end planning. A high level of trust among team members must also be present. Streamlined approvals – Simplifying the approval process will help you save time that can be utilized at other stages in the process. There will be human barriers, but we must be prepared to adjust our traditional processes (e.g. design reviews, procurement, change control) to meet the need for Flash Tracking. Two-Gate Front End Planning Process – Flash Tracking requires re- engineering of CII’s traditional gate process to concurrently complete Concept (FEP-2) and Detailed Scope (FEP-3). This level of concurrency is an innovative delivery strategy, requiring exceptional execution of all normal front end planning activities. Each practice is ranked based on CII research results on that specific practices importance to successful project delivery. A facilitated assessment session is conducted to help project stakeholders assess and evaluate how effectively each practice is currently implemented. 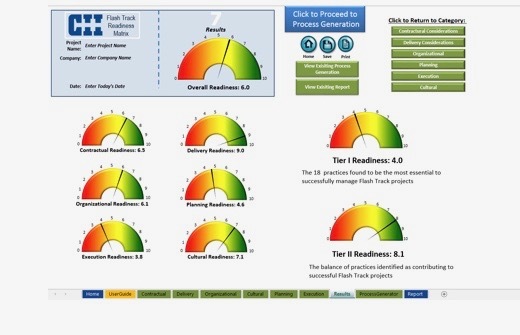 The Readiness Dashboard summarizes the assessment results and helps projects stakeholders determine their readiness to undertake the project on a Flash Track basis. The assessment provides recommended strategies to address any practices that scored below the recommended readiness level. We hope your community never finds itself on the other side of an extreme weather event. But if you do, we’re here to help. Valency is a CII Registered Provider with trained facilitators to assist your team in rapidly kicking-off a successful Flash Track project. Conducting a Flash Track Readiness assessment is ideal to lead your project stakeholders through the first interactive planning session in any Flash Track project. It’s a proven strategy to establish a Flash Track philosophy from the very start of the project.